This winter's breakout anime was, undeniably, Mob Psycho 100. 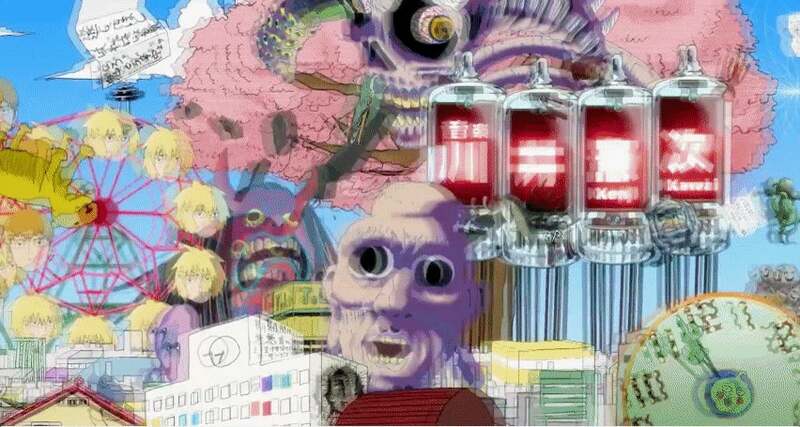 From the creator of 2015's viral anime One-Punch Man, Mob Psycho 100's first season was an absurd, psychedelic feast drawn up by Studio BONES. Its frenzied art style is unmatched by any other contemporary anime, although Masaaki Yuasa-directed titles like Mind Game or Kaiba come close in spirit. Mob Psycho 100's art reaches expressive heights unexplored by similarly shōnen-tinged titles. However, that same irreverence for convention did no favours for Mob Psycho 100's plot or pacing. Pushed forward by fever-dream animation, Mob Psycho 100 felt tired after the first few episodes, and even throughout its ending's full realisation of shōnen tropes. Sometimes, it turns out, rules are a good thing — even if they're being broken. 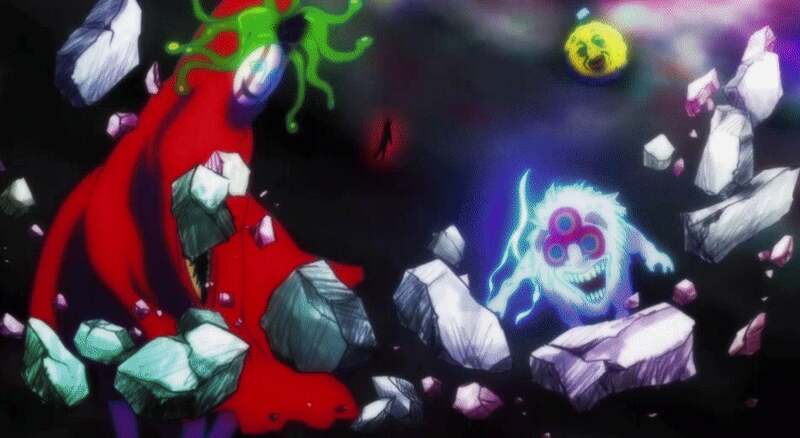 From the very second Mob Psycho 100 begins, it is unabashedly over-the-top. In a dreamy wasteland, purple beams gather around a blackish, fuming child. He turns to face approaching monsters — huge, toothed worms or crawling pink blobs — undoubtedly inspired by bacterial microorganisms. Against a dark sky, purple lightning strikes. Then, an explosion. It's dazzling. All the time, a ticker on-screen approaches the number 100. The boy is Shigeo Kageyama, known as Mob, and that number is when he goes berserk. A narrator describes the spirit world. "There are those who fight every day to shine a ray of hope into that chaotic darkness. People call them 'psychics'." Mob is among the most powerful of them, and can do any number of ESP-related tricks, from bending spoons to exorcising demons. But really, a mega-powerful ESPer is just a small portion of who he is: "Mob" means "background character". Before his internal stress meter hits 100 — so, most of the time — Mob is an aggressively mediocre junior high-schooler with dead eyes and a bowl cut. The show's main conflict exists in part in Mob: The battle between mundanity and the extraordinary. 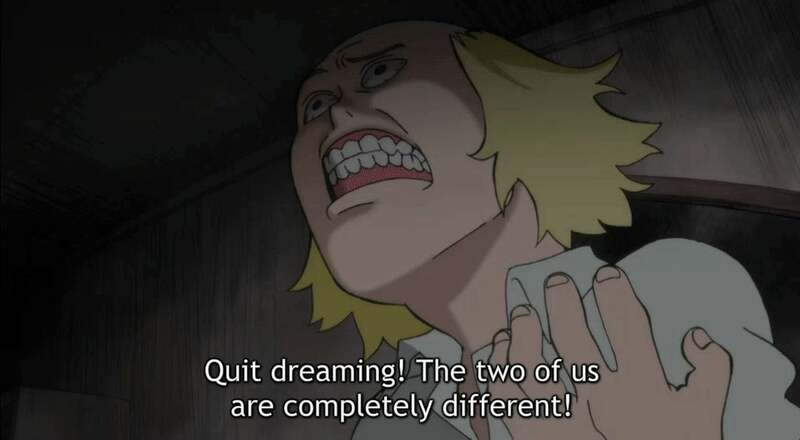 This is the tired trope that carries through Mob Psycho 100's 12 episodes. It has its moment, but overall, throughout the series, it becomes more tired with each incarnation. First things first: The anime's opening is brilliant. No colour went unused. I've watched it several dozen times and always find new delights. An assortment of items, spanning from potted plants to apples and tennis rackets and cracking eggs swirl around Mob. In every shot is a mixture of everyday life and psychedelica, which sets the tone for the anime. Here, we learn that this is a show about contradictions. 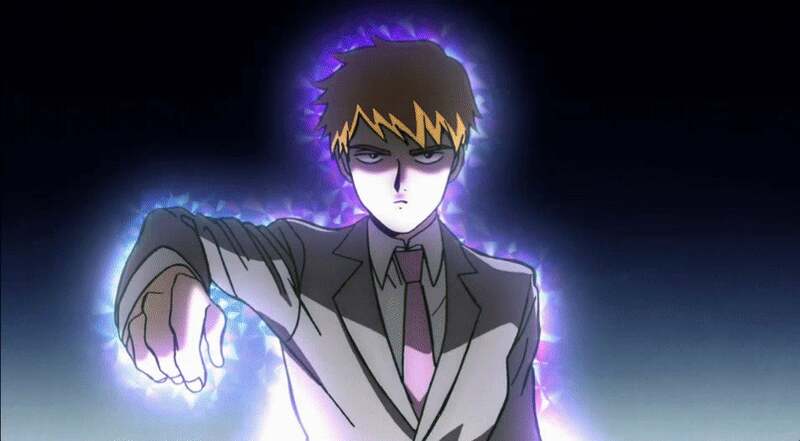 In the show, Reigen Arataka is introduced before Mob, fittingly, since he's by far my favourite aspect of Mob Psycho 100. He's a charlatan psychic whose special exorcism techniques include massage, salt-throwing and Photoshop. He's the cheapest "psychic" in the area and has convinced Mob that he's on a level of ESP so powerful that Mob just can't comprehend him. So, Mob is Reigen's cash cow, exorcising demons on his behalf. Mob idolises him, convinced that he is a true psychic master. In part, that's because Reigen is a master of something else: Pretending. He is Mob's foil. 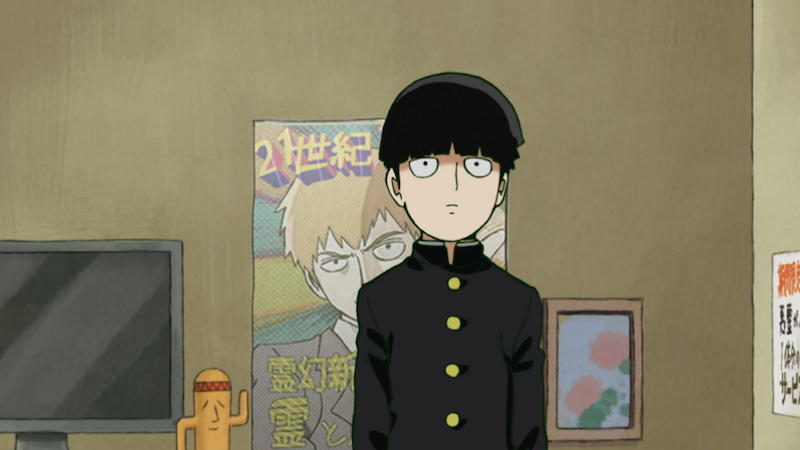 The contrast between Mob, who is all-powerful but uncharismatic, and Reigen, who is impotent but magnetic, is the one instance where the anime's tension between opposites does not get old. At the series' culmination, Mob and a few other ESPers are trapped in a facility for psychics. Annoyed that he can't find his cash cow, Reigen arrives at the dangerous, far-flung institution in a silly taxi. The useless Reigen nonchalantly walks up to over a dozen guards and asks what's up. His stupid self-assurance indicates to the guards that he's a higher-up in the organisation, so, terrified, they let him in. Like One-Punch Man, Mob Psycho 100 relies on anticlimax for comic effect. In One-Punch Man, protagonist Saitama's explanation of how he became invincibly strong is the best example of this: 100 push-ups, 100 sit-ups, 200 squats and a 10km run. One's sense of humour translates here, but at times too obviously: Mob, whose psychic powers make him nearly invincible, is a total shrimp. So when he's asked to consider joining the ESPer club, he instead joins the "body improvement" club for weight-lifters. For me, the delivery didn't quite hit there, though it did contribute to Mob's character development. Also underwhelming was the arc that had Mob fighting his spiritual antagonist. 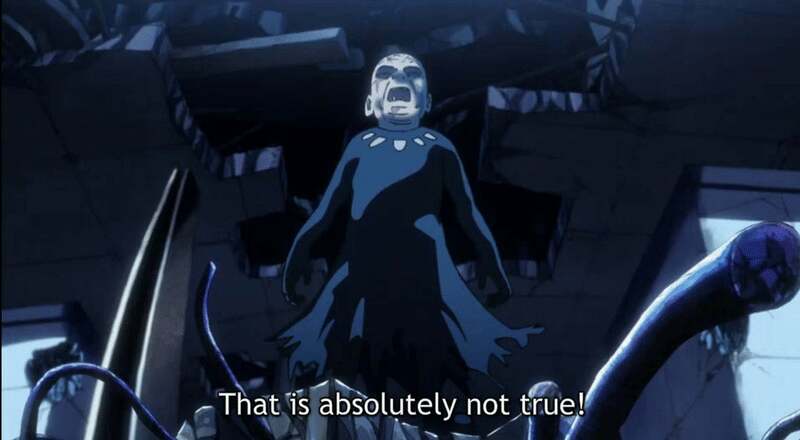 Mob's mantra, which we learn Reigen taught him, is to never use his powers, and especially never against other people. Black Vinegar Middle School's shadow leader Teruki Hanazawa, on the other hand, uses his powers in all areas of life without any heed. Unlike Mob, he's handsome, popular, sporty and academic. He disregards non-ESPers as "commoners" while flinging the indifferent Mob around in the air. Of course, Mob is stronger than him, but doesn't want to fight. Mob accuses Hanazawa of being an average kid just like him, but only with a veneer of glamour falsely induced by psychic powers. After an extended, one-sided battle, Hanazawa eventually chokes him out with his bare hands. The narrator then says, "The battle between these two ESPers never reached its conclusion. As a result of rejecting each other's ideals, there was no victor, and they were only left with a feeling of emptiness deep in their hearts." Then, Mob goes berserk. After Hanazawa and Mob face off, the ESP freak decides to adopt Mob's more passive way of life. Although the fight scene animation was glorious, the actual tension between the two characters was poorly set up and not very interesting. The fight was a whole episode long, not unusual at all for a shōnen title. But what was unusual was how the antagonist was introduced with little backstory, pomp or circumstance, a mere half-episode before their blow-out. Suspense, one of shōnen's defining features, was an after-thought. To preface this line of thought, I must note that I watch anime with certain generic expectations. I think a lot of anime fans do. With certain genre categorisations come rules and tropes, which studios play with to best entertain and surprise viewers — for example, Madoka Magica is wildly successful because it plays to viewers' expectations of magical girl anime, and then subsequently goes dark, killing off magical girls and revealing the toxic nature of magic more generally. It breaks its own rules — but the rules were there to be broken. Mob Psycho 100 doesn't seem to have any rules except its rule of opposites. Mob Psycho 100 was published in Weekly Shōnen Sunday. Not all shōnen is made alike, but there are a few things I calibrate my expectations to, suspense being a main factor. Themes like self-betterment and action are present in Mob Psycho. An eye for pacing is what ties these things together. 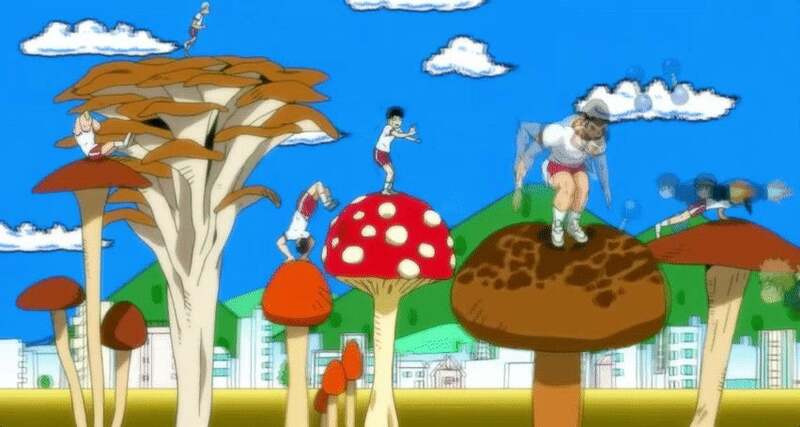 Unfortunately, Mob Psycho 100 was fraught with plot-backfill. The context necessary to really appreciate a scene was, often, given afterwards and served cold. 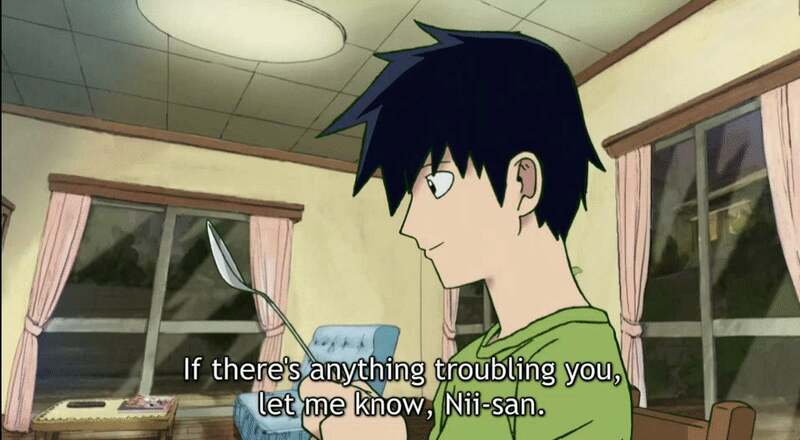 Take, for example, Mob's younger brother, Ritsu Kageyama. For several episodes, Ritsu is an adoring brother. He's a lawful, kind guy with sparkling eyes. Suddenly, halfway through the series, it turns out that Ritsu has always been jealous of his brother's powers — even scared of them. And, suddenly, he attains some mild powers of his own. Then, he becomes evil. Perhaps Ritsu's adoration was too saccharine and over-the-top, but if that's Mob Psycho's version of foreshadowing, the pay-off didn't quite hit right when Ritsu went black. "Do you remember when you were little, you'd cry your eyes out because you couldn't bend spoons?" Ristu is asked. "The buddy-buddy brother act ends now," Ritsu says. This tension could have been really amazing, if it was drawn out appropriately. Instead, it felt jagged and sudden. 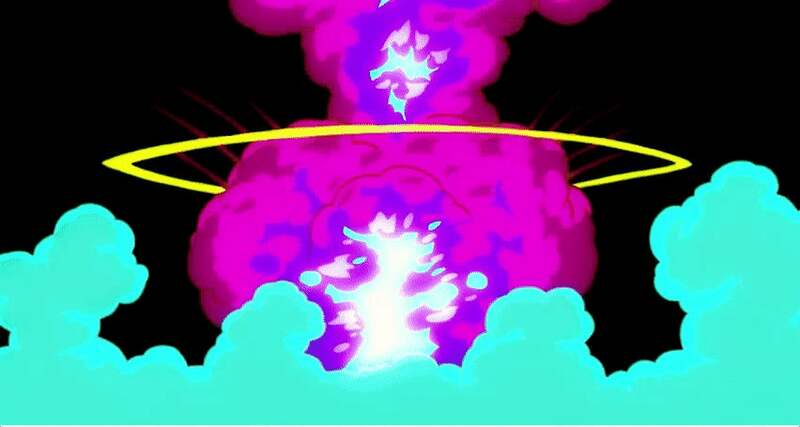 It's also worth adding that viewers had little information about the season's final boss until he was nearly defeated. The big reveal was that he was old — not a compelling or humorous enemy, especially since he was wearing a mask all the time. The show had a lot of special moments. 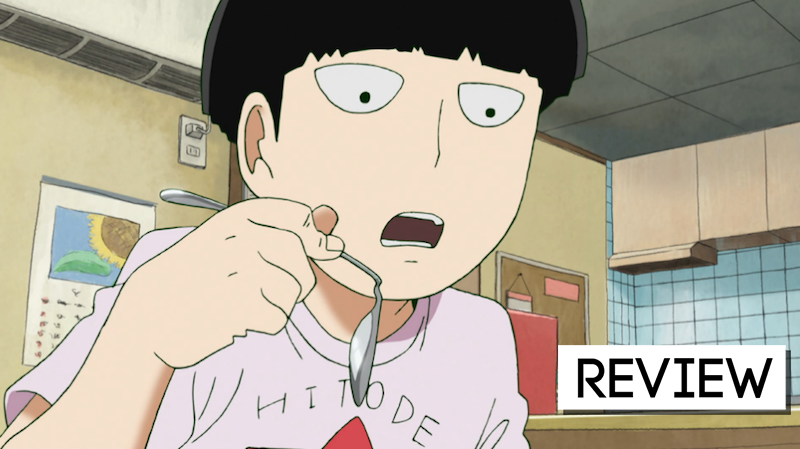 When Mob puts a spoon of omelette to his mouth and inadvertently bends the spoon with telekinesis, I giggled when his mum attributed the ESP flare-up to puberty. Or when Reigen tells a client that the Himalayan rock salt he's using to exorcise a demon also goes great on pasta, that got a solid chuckle out of me. Many good moments, however, weren't given enough regard by the show's lack of constraints or foreshadowing. In fact, we don't know the extent of Mob's powers, at all, giving them a limitless feel that, to me, lacks excitement. Hopefully, season two will do justice to the show's impeccable animation and ripe raw material. In the meantime, I'm waiting for the next One-Punch Man instalment.